How will these infographics help me and my business? We believe useful infographics are a great way to share knowledge, whether they summarise trends from statistics or approaches to marketing. We’ve developed our infographics to help marketers tackle digital marketing in a more structured way. 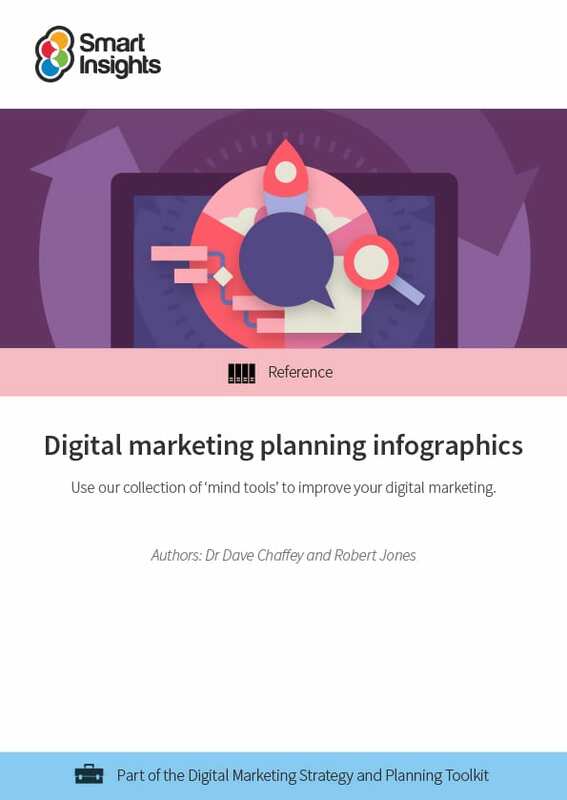 They're not ordinary stat-rich infographics, but structured mind tools to explain digital marketing concepts and help you think through the options to improve marketing approaches, either through individual analysis or discussion in a team. They're all practical tools we use many of these infographics actively in group activities in our in-company digital strategy training workshops. Our infographics are intended to help you map, plan and manage your approach while explaining some of the core approaches that make digital marketing successful. Authors: The majority of these infographics were created by Dave Chaffey of Smart Insights in partnership with First 10. Robert Jones also contributed to this guide.